New Solar Installation Record - Fonon Technologies Inc.
Approx. 500,000 homes installed solar in the United States in 2012 – (Solar Energy Industries Association). That’s a 76% increase over 2011! We’re so glad to see wider scale adoption of clean energy, and not just because we’re in the solar biz. We’re in this business for the betterment of our collective ecological situation. So GO GREEN in ’13! That’s a nice new record, 500,000 homes with new solar installations. What’s more astonishing is the substantial increase in American solar installations from the previous year. This shows a very significant movement. Over 3.3 gigawatts of solar installations occurred across the USA in one year. Congratulations to all of those home owners who got tired of constantly paying high electric bills; tired of being forced to be more energy efficient with each passing year. Our congratulation is for their wise choice to move to away from energy efficiency, to energy independence. For the rest of you, we want to help you beat that 2012 record! What if you didn’t have to shop around at retail to try to find panels, inverters, framing/mounting, et cetera? What if you could get a complete solar package deal, engineered for your location and ready to install, RIGHT NOW? For a limited time, while supplies last, even though Fonon Solar is a manufacturer that usually deals with b2b, we are offering our 5kW AP3 (American Private Power Plant) direct to home owners. We make it easy for you to join the movement. Make your own electricity; be your own power plant. 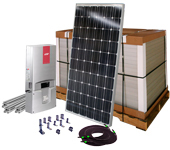 Get this complete system, a ready to install solar kit. You can find your own installer, or we’ll do it for you (extra charge).